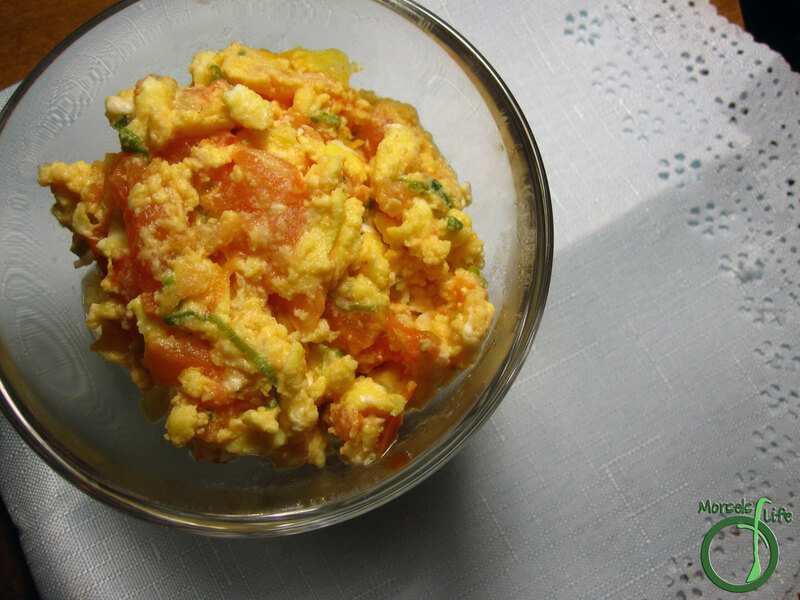 A quick, easy, and tasty version of scrambled eggs using tomato and green onions for extra color and flavor! It's been a busy few weeks around here, so when I needed to make another side, I knew I wanted something quick, easy, and tasty. I know I'm always saying that, but this time, I wanted something extra quick and easy. (It also had to be tasty - otherwise, what would I share with you all?!? I don't want you blaming me for bad meals, after all.) Well, this dish perfectly fits the bill for quick, easy, and tasty! In fact, it's not much harder than scrambled eggs. This dish can also substitute as meat for those of you concerned about protein intake. In fact, the USDA categorizes eggs as meat due to their protein content. It's a good protein since it's 91% bioavailable once cooked (compared to 51% raw). Chicken eggs contain all the essential amino acids for humans. They also contain Vitamins A, B, D, and E as well as choline, iron, calcium, phosphorus, and potassium. In fact, the egg is one of the few foods that naturally contains Vitamin D. However, the majority of the nutrients are in the yolk. Did you know you can determine the relative age of an egg by the air bubble at the larger side of an egg? The larger the air bubble, the older the egg. That's also how eggs are graded, from AA to A to B. And, really, really old eggs will actually float! Anyway, back on topic. You've got the egg, now just throw in some chopped tomato. Mix it all together with the eggs, and then throw in some green onions for flavor and color! That's it - you've got yourself some quick, easy, and tasty food! I usually eat this dish as a side, but you could also eat it with breakfast. What's your favorite way to eat eggs? 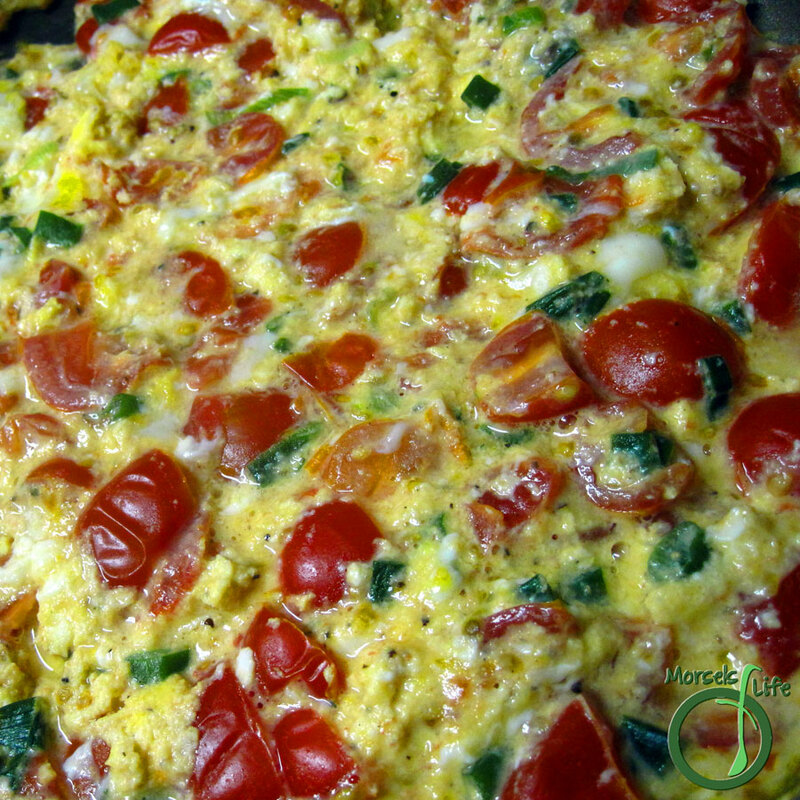 Scramble eggs, mixing in chopped tomato as you go. Add in green onions just before eggs are finished, and mix in.